Raw desserts are one of my favourite things to make. I love them because they’re simple to create, you just need a food processer or a blender. They can be stored in the freezer, so you always have them on hand. Also, they’re mostly made out of raw nuts, making them a nutritious indulgent treat. These bars are not only pretty but they taste heavenly. The dessert has an luscious creamy texture and of course chocolate…because we all need chocolate to live right? The cashew nut is a wonderful dairy alternative in desserts because they get super creamy when soaked overnight and blended. When cashews are mixed with coconut cream you get the ultimate velvety milky texture. The bottom layer of the dessert is made from dates, almonds, and raw cacao, the simple recipe for a raw brownie. I garnished this dessert with dried rose petals and bee pollen. 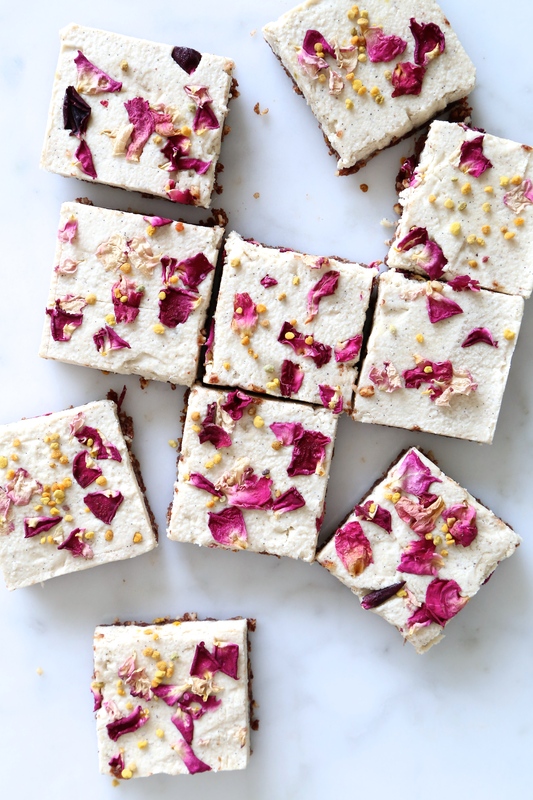 Rose petals are not only beautiful but they have a pleasant floral flavour that tastes wonderful with vanilla and honey. Bee pollen is regarded as a superfood that reduces inflammation, boosts immunity, and is full of anti-oxidants. Bee pollen also makes for a lovely ‘natural’ sprinkle. Feel free to omit the garnishes altogether or get creative with garnishes of your own! Please let me know if you love this recipe as much as I do! Line both sides of the baking pan with parchment paper, allowing overhang for handles. Begin the chocolate layer. In a food processor pulse the almonds into a coarse flour. Add the remaining ingredients and pulse until a dough forms. Spread the mixture into baking pan, and press to arrange evenly. Place in freezer while preparing the cream layer. Begin the cream layer. Blend all the ingredients until very smooth. Pour over the chocolate layer and spread evenly. Place in freezer for 30 minutes. At 30 minutes, remove cream bars from the freezer. Garnish with rose petals and bee pollen by gently pressing into the cream layer. Freeze for an additional 30 minutes. Slice the cream bars into 9-12 bars. Enjoy immediately or freeze and thaw briefly until ready to serve. Bars will keep in the freezer for 3 weeks. *If you can't find coconut cream feel free to purchase full fat coconut milk. Flip the can upside down and gently pour out the milk. The cream should remain on the bottom. You should get at least 1/3 cup in 13.5 fl oz can. This entry was posted in Dessert and tagged bee pollen, beegan, coconut milk, plant-based, raw desserts, rose, Vegan. Bookmark the permalink.